All tracks were spontaneously composed in the studio by the musicians. Arrangements by Guy Segers. Cover painting “Interstellar Space” by Silena Lena. Thanks to Catherine Smet who had the idea at the start and Guy Segers without whom the end product could never have been made. We’re delighted to make this music available. You’ll know Guy Segers from his days as bass guitarist with the influential and brilliant RIO group Univers Zero, but you may not know that Guy has been a tireless creator and releaser of music – often via his own Bandcamp page – up to the present day. 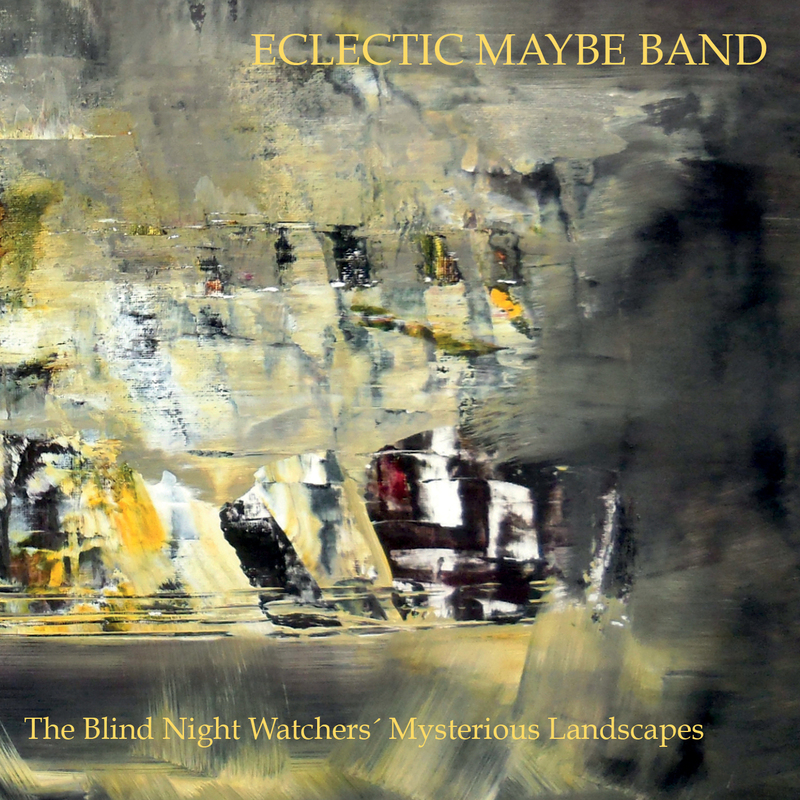 This new release by Eclectic Maybe Band has a great vibe and atmosphere to it. A group of highly skilled and compatible players came together in the studio under Guys’s direction and made some improvisations. Although improvised the outcome is stylistically varied. Some tracks make you think of electric Miles filtered via zeuhl, while others are freer and open ended. Really flexible and great sounding bass and drums provide an ever shifting backdrop. The guitar is angular, surprising, expressive, a real stand out performance. Flute is the main horn at the forefront, blown by the wind eerily back and forth over the tracks, with the saxes digging in occasionally. Very original use of keys here too, especially when a rather icy grand piano cuts in. These initial improvisations have been carefully restructured in post production by Guy to produce a result very much in keeping with the Discus Music spirit. Among other positive opinions, UK-based Discus Music cranks out one audiophile quality album after another. The experimental label does not cut corners, and taking into consideration the disparate soundstages, tonal attributes and instrumentation, the music often simulates 3D-like sonic characteristics. These factors also come in handy when demoing stereo equipment at your local high-end dealer. Otherwise, The Eclectic Maybe Band created these gems via an instantaneous compositional approach, where jazz meets rock, and musical syntaxes possibly emanating from distant galaxies. The musicians wave their magic wands during these semi-structured and largely improvised tracks compiled with amorphous sound-shaping additives, free jazz, sharp contrasts, blossoming progressions, subliminal EFX backwashes and disquieting panoramas. But subtle surprises appear throughout. For instance, on "Gradual Assistance" drummer Dirk Wachtelaer's silvery cymbal swashes spawn a sense of urgency amid glowing timbral qualities that shadow Guy Segers simple bass line and Roland Binet's supple flute work. Although the plot takes a 360-degree turn on the following track, "Second Permission Secrete," where a loping, laisse faire groove generated by the drummer's sweeping, pulsating brushes and Catherine Smet's clement synth. "Gobsmacked Distraction" starts with Smet's carnival-like organ vamp and free jazz piano choruses atop the drummer's peppery support; Seger's nimble bass notes, and a sped up jazz rock motif, lead to multiple conversations taking place in unison. But Delville once again plays the devil's advocate due to his frenzied and slashing e-guitar licks. Moving forward, the band chooses a different strategy with "Suppot Provisoire," which is improvised atop Wachtelaer's medium-tempo backbeat, and radiated by his crisp hi-hat pulse and snappy snare drum hits. Add Binet's jazzy flute soloing, Smet's punctuated comping, Segers melodic passages and the band generates a cheery vibe. Even though it's improvised, the musicians' telepathic interaction infers a well-rehearsed composition. Was macht eigentlich Guy Segers inzwischen, einstmals klang- und stilprägender Bassist von Univers Zero (und bisweilen bei Present), und zudem einer der Macher des belgischen Labels Carbon 7? Carbon 7 gibt es schon seit ca. 10 Jahren nicht mehr (zumindest gab es seit dem Jahre 2007 keine neue Veröffentlichung), und bei UZ ist Segers schon lange ausgestiegen. Aber, bisweilen greift er immer noch zum Bass, für Franck Balestracci z.B. (von dem man leider auch schon länger nichts mehr gehört hat), Gurumaniax (siehe "Psy Valley Hill"), Acid Mothers Guru Guru Gong, oder im Trio Uneven Eleven (mit Charles Hayward und Makoto Kawabata). Seit Kurzem (es ist nicht ganz klar, seit wann es das Projekt gibt), hat er zudem eine neue, eigene Gruppe. Oder, er ist zumindest einer der Köpfe der Eclectic Maybe Band, zu der auch Michel Delville (u.a. douBt, Machine Mass Trio, The Wrong Object), der schon erwähnte Franck Balestracci und Andy Kirk (auch einstmals bei Univers Zero) gehören. Kirk und Balestracci sind allerdings auf dem hier rezensierten Tonträger nicht zu hören. Im Oktober 2016 spielte die oben angegebene Besetzung der Formation allerlei Material ein ("spontaneously composed" steht im Begleitmaterial des hier rezensierten Tonträgers), und "arrangements by Guy Segers). Im Frühling 2018 gibt es davon nun eine CD, erschienen bei Discus Music, und versehen mit dem komplizierten Titel "The Blind Night Watchers' Mysterious Landscapes". Das gut gefüllte Album kommt im platzsparenden, aber sehr elegant aussehenden Hochglanzpappfaltteil, in dem Discus nun schon seit Längerem seine CD verpackt. Improvisierte Musik gib es hier zu hören, die allerdings erstaunlich rund und klangvoll dahin treibt. Allzu free oder wüst geht es nicht zu. Gut, bisweilen schon (man höre "E-forks and ornaments", oder "Gobsmacked distraction"). Meist wird aber farbig, vielseitig und virtuos musiziert, grooven die Klänge mal luftig, mal kantig voran, mal freiformatig tonbastelnd, mal rockig treibend (man höre z.B. "Second permission secrete", oder "Suppot provisioire"), mal jazzig swingend (im abschließenden "Erased evidence" z.B. ), mal entspannter klangmalend (man höre "Hidden wave variation"). Allerlei Elektronik und Keyboardsounds sorgen für ein voluminöses Klanggefüge und füllende Hintergrundsounds, in denen sich die bisweilen sehr expressive E-Gitarre, der warm knurrende Bass, das hallend-kernige Piano, und elegisch bis jazzig hallend eine Flöte bzw. verschiedene Saxophone bewegen. Bisweilen (in "E-forks and ornaments" z.B.) sind auch menschliche Stimmen auszumachen (die aber wohl vom Sampler kommen). Das Ergebnis sind ausladende, sehr abwechslungsreiche Nummern, die sich irgendwo im Grenzgebiet von Avantprog, Jazzrock, Free-Rock, Elektronik und freiem Klangbasteln bzw. -malen bewegen, und dabei sehr klangvoll und voluminös voran treiben. Mit der Musik, die Segers früher oder Delville rezenter gemacht haben hat "The Blind Night Watchers' Mysterious Landscapes" eher wenig gemein, kommt die Musik doch freier und unstrukturierter daher (vor allem im Vergleich zum Kammerrock von Univers Zero). Gewisse klangliche Bezüge und geistige Verwandtschaften lassen sich aber erkennen, und es sollten wohl vor allem diejenigen an progressiven Klängen interessierten Leser zum Kundenkreis für die Musik der Eclectic Maybe Band gehören, die die Hervorbringungen der früheren Projekte der Protagonisten schätzen. Con la dupla de ‘Pluie Étanche’ y ‘En Absence D’Action’, el disco comienza a lo grande con frontales muestras de agudeza creativa: 11 minutos de magia vanguardista en las cuales el ensamble exhibe una ingeniosa confluencia de climas oníricos, cadencias libres y sombrías atmósferas surrealistas. ‘Pluie Étanche’ comienza con unos parcos golpes en los platillos seguidos por un imponente redoble casi marcial que pone en marcha un despliegue de tensas deconstrucciones que, por alguna extraña razón, se adentran en parajes etéreos absorbidos por un misterioso candor. En medio de las columnas respectivamente edificadas por el groove de la batería y los abordajes del piano, los demás instrumentos van haciendo sus aportes con un clima de libertad que busca establecer algún punto de diálogo mientras el asunto va transcurriendo con misteriosa elegancia. ‘En Absence D’Action’ sigue ahondando en las huellas de lo etéreo para hacer que el predominio de lo misterioso se adentre concienzudamente en lo sombrío. Casi como si se tratara de un paisaje de una agradable tarde primaveral en el Purgatorio, los protagónicos enclaves de la flauta, el saxofón y el sintetizador se encauzan por una ambientación flotante cuya serenidad exterior no oculta del todo la ansiedad metafísica que late con solvente expresividad en un no muy derruido trasfondo. Es como un interludio de una pieza de alguno de los cuatro primeros álbumes de UNIVERS ZÉRO que ha pasado por una cirugía krautrockera bajo los auspicios de CLUSTER. Cuando llega el turno de ‘Gradual Assistance’, el ensamble está preparado para explorar el aún más bizarro terreno de un free-jazz remodelado bajo la lógica de la musique concrète en su faceta más traviesamente dadaísta. El armazón adquiere un foco más vitalista poco antes de llegar a la frontera del tercer minuto y medio, lo cual inicia el remolque hacia un estupendo crescendo dirigido por la dupla rítmica mientras el piano se encarga de enfatizar ciertas cadencias y la guitarra se regodea en ácidas capas psicodélicas. ‘Second Permission Secrete’ se orienta hacia un fulgor sonoro definido dentro de unas pautas enmarcadas a medio camino entre el nu-jazz y el krautrock electrónico. La guitarra de Delville sale rampante al frente por primera vez mientras el bloque instrumental aprende a acostumbrarse a ceñirse a un esquema rítmico cerebralmente estructurado. Tenemos en la secuencia de estas dos piezas sendos un continuado punto culminante del repertorio. El primer tema pretenciosamente largo del disco es el que se llama ‘E-Forks And Ornaments’ y dura poco menos de 10 ½ minutos. Todo comienza con desgarradores riffs filudos de la guitarra y belicosos arranques de la batería, articulándose a lo largo del camino una confluencia entre los estándares intrépidos de HONEYELK, HENRY KAISER y los HENRY COW de la etapa 75-78 para lo que ha de erigirse como el primer cuerpo temático de la pieza. El segundo cuerpo tiene una estructura más reconocible, enfilándose hacia una ambientación agria y tenebrosa que suena a algo así como una partitura perdida de PRESENT reciclada por un combo de músicos de DOUBT y MASSACRE. Más largos son aún los dos siguientes temas, los cuales responden a los títulos de ‘Gobsmacked Distraction’ y ‘Hidden Wave Variation’, respectivamente (11 minutos y casi 12 ¾ minutos de duración, respectivamente). En el caso de ‘Gobsmacked Distraction’, tenemos una elaboración de climas combativamente aleatorios en perfecto alineamiento con la ideología descoyuntada del free-jazz, aunque late allí el vigor rockero de forma permanente bajo la consigna indicada por la batería de Wachtelaer. Este señor maneja sus tambores y platillos con un nervio fulguroso mientras la guitarra, el saxofón y el teclado perpetúan sus agresivas discordias dentro de un caos supervisor que garantiza que la tensión sostenga una unificación a través de sí mismo. Por su parte, ‘Gobsmacked Distraction’ decide empezar con un talante sigiloso por vía de sucesivos pasajes de saxo y flauta que ostentan un extraño lirismo, todo ello mientras el bajo exhibe bases distorsionadas sumamente etéreas. Este extenso preludio se encarga de agitar las cosas no para motivar los fundamentos de una explosividad exultante y sumamente neurótica como la que signó a la pieza precedente sino para abrir la puerta al sereno motif recurrente de piano sobre el cual girará buena parte de la segunda sección de la pieza, una sección gestada por una espiritualidad contemplativa: lo lírico se amplía y refuerza. Así las cosas, el ensamble se dispone a explorar sonoridades ingrávidas que brotan de la faceta más introvertida de su osada visión musical. Cerca del final, algunos efectos electrónicos filtrados por la guitarra insuflan una suave bocanada de mágica extravagancia al asunto. Pod pojmenováním The Eclectic Maybe Band, jehož album The Blind Night Watchers´ Mysterious Lanscapes, nahrané 2. října 2016 v Dé Studiu (v belgickém Asse), se od prvních tónů vzedme s rockovou spontaneitou, si asi stěží něco vybavíte. A možná vám stejně tak mnoho nenapoví, když uvedu, že v obsazení čteme jména flétnisty a tenorsaxofonisty Rolanda Bineta, sopránsaxofonisty, hráče na doudouk a elektronika Joeho Highama, Michela Delvilla s elektrickou kytarou a Dirka Wachtelaera nad bicími. Snad začne svítat, prozradím-li, že celý projekt nastartovala a promyslela keyboardistka Catherine Smet. Ale určitě se zcela rozjasní, když přiznám, že celek obohatil, prozřejmil, rozaranžoval a promixoval basista a samplerista Guy Segers, známý především z legendárních Univers Zero. Všech devět atmosférických zastavení však vzešlo s kolektivní spontánností přímo ve studiu a mají na něm podíl i ostatní hudebníci.